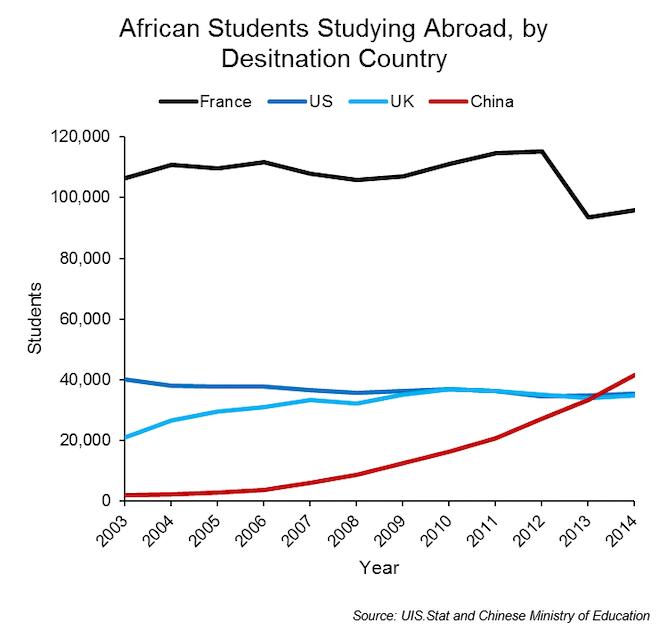 The surge in the number of African students in China is remarkable. In less than 15 years the African student body has grown 26-fold – from just under 2,000 in 2003 to almost 50,000 in 2015. According to the UNESCO Institute for Statistics, the US and UK host around 40,000 African students a year. 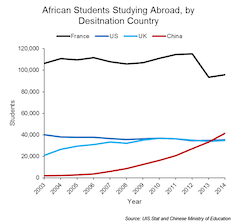 China surpassed this number in 2014, making it the second most popular destination for African students studying abroad, after France which hosts just over 95,000 students. 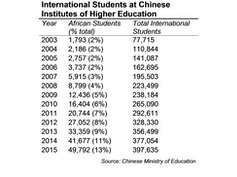 For years, these numbers have remained untranslated in the online archives of the Chinese Ministry of Education. But a recent initiative by Michigan State University researchers to translate them introduces the reports to a wider audience. China has overtaken the UK and US. Not only have these reports revealed the growth in China-Africa ties. They also make it possible to compare China’s international education trends in a global context. Chinese universities are filled with international students from around the world, including Asia, the Americas, Europe and Oceania. The proportion of Asian international students still dwarfs the number of Africans, who make up 13% of the student body. But this number, which is up from 2% in 2003, is growing every year, and much faster than other regions. Proportionally more African students are coming to China each year than students from anywhere else in the world. The proportion of African students at Chinese universities is steadily growing. This dramatic increase in students from Africa can be explained in part by the Chinese government’s targeted focus on African human resource and education development. Starting in 2000, China’s Forum on China-Africa Cooperation summits have promised financial and political support for African education at home and abroad in China. Since 2006, China has set scholarship targets to aid African students coming to China for study. For example, at the most recent 2015 summit, China pledged to provide 30,000 scholarships to African students by 2018. Although China stopped publishing regional scholarship data in 2008, our data analysis using the 2003-2008 data to generate scholarship estimates suggests that this target is on the way to being met. China seems to be upholding the pledges made towards African education. For the Chinese government, providing education to Africans is an extension of China’s soft power – cultivating the next generation of African scholars and elites. The experience that these students get in China can translate into a willingness to work with China and view China’s internal or external policies favourably in the future. Providing education to Africans is an extension of China’s soft power on the continent REUTERS/How Hwee Young/Pool. But what do African students gain in return? China-Africa scholars have found that students head to China for many reasons. Some simply go to pursue an education that is affordable, even without a scholarship, while others go for the chance to develop business connections or learn the language of a country presumed to be a rising power. Based on several surveys, most students tend to be enrolled in Chinese-language courses or engineering degrees. The preference for engineering may be due to the fact that many engineering programs offered by Chinese universities for international students are taught in English. The quality of education has received mixed reviews. Some studies have shown that African students are generally satisfied with their Chinese education, as long as they can overcome the language barriers. Others found that even if students were not impressed with their education, they appreciated the trade and business opportunities that a Chinese education made available to them back home. It’s difficult to know exactly which African countries are sending the most students to China. These details are not kept by the Chinese Ministry of Education. But the statistics from Tsinghua University provide an insight. In the 2015-2016 academic year, the majority of the university’s 111 African students came from Zimbabwe, Ethiopia, Tanzania, Morocco, Eritrea, and Cameroon – slightly favouring East Africa. African students in France overwhelmingly come from francophone West Africa. If Tsinghua’s profile holds true for the larger African student body in China, it means China is an increasingly important player in the education of countries outside of West Africa. Due to Chinese visa rules, most international students cannot stay in China after their education is complete. This prevents brain-drain and means that China is educating a generation of African students who – unlike their counterparts in France, the US or UK – are more likely to return home and bring their new education and skills with them. 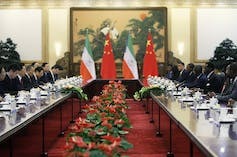 It’s still too early to tell how these new dynamics might be shaping geopolitics on the continent. Note: The original, untranslated Chinese Ministry of Education reports are available as follows: 2003, 2004, 2005, 2006, 2007, 2008, 2009, 2010, 2011, 2012, 2013, 2014, and 2015. The Ministry archives were missing reports for 2010 and 2013. 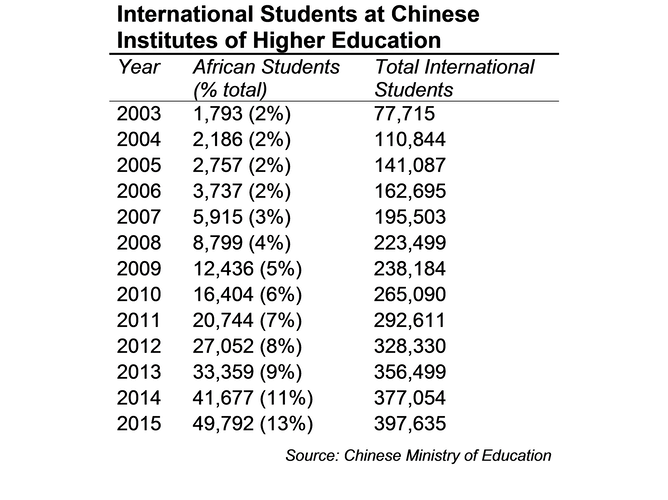 Student numbers for these years were calculated using the percent-growth reported in 2011 and 2014 reports, respectively.